Judging by their Instagram feeds, it would appear that many top bloggers practically live in luxury hotels (tough gig). Given the beauty of these five-star properties that they stay in around the world, we can't blame them for splashing them all over Instagram. If you can look past the marble bathrooms, picturesque European balconies, and fluffy beds strewn with designer bags and breakfast pastries, you'll notice that many hotels that these It girls stay in frequently pop up on their fellow blogger's feeds as well (you'd think there was a blogger convention at the Park Hyatt Paris-Vendôme during every fashion week). While looking at Instagrams of luxury hotels isn't quite as pleasurable as staying in one, it's certainly fun to get a glimpse into your favorite bloggers' favorite spots to rest their heads around the world. Keep scrolling to check out 10 luxury hotels that bloggers love, and shop some of their stylish travel essentials! This boutique hotel in the Lower East Side is a favorite of Courtney Trop of Always Judging, Jacey Duprie of Damsel in Dior, and Jessica Stein of Tuula Vintage, to name a few. Their favorite Instagram spots at The Ludlow Hotel are the roof patio overlooking the city and the perfectly appointed bathrooms. As we mentioned above, Park Hyatt Paris-Vendôme is a blogger haven come fashion week, and they seem to love it enough to spend their off-duty time there as well. 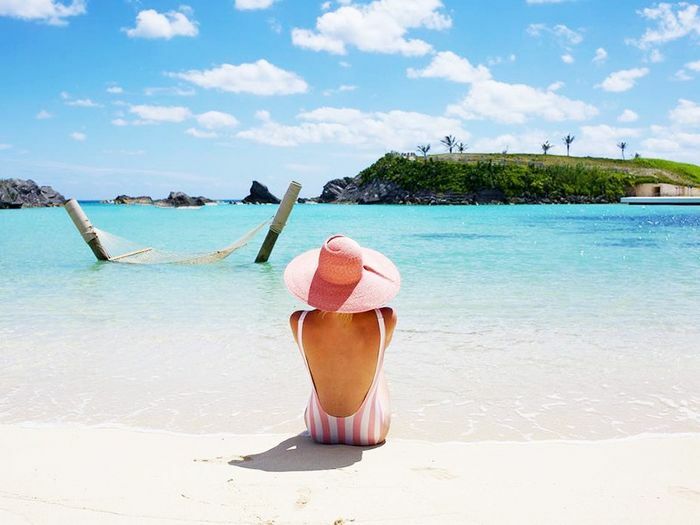 (It appears to be Chiara Ferragni's home away from home.) The sleek hotel is decidedly modern but with a hint of Parisian charm, naturally. Bonus: It's situated steps away from the 2nd arrondissement's equally Instagram-worthy landmarks (i.e. the Louvre). Given it's proximity to Los Angeles, The Parker Palm Springs is a blogger go-to for both weekends away and Coachella. The colorful, mid-century modern décor set against the desert backdrop makes for a bright and cheerful addition to the Instagram feeds of top bloggers like Sincerely Jules's Julie Sariñana and Margo & Me's Jenny Cipoletti. The London EDITION, a boutique hotel in the city's prime Soho district, is the epitome of British glamour, down to the light fixtures. The modern, wood-paneled rooms are a stunning contrast to the lobby's dramatic European character. It's easy to see why it's the fashion blogger hotel of choice when visiting London. When it comes to Old Hollywood luxury, Hotel Bel-Air takes the cake. The private hotel is filled with enough pools, ponds, balconies, and beautiful dining patios to fill a blogger's entire Instagram feed. And did we mention that it's painted a perfect shade of pale pink? bathroom #goals @hotelbelair • obsessed with @champalimauddesign @alexandrachampalimaud designs #dcmoments TAKING OVER @champalimauddesign's account this wknd so follow along! It's hard to imagine a place more stunning than the romantic Le Sirenuse along the Amalfi Coast in Positano, Italy. The world-renowned property is a favorite of travel-seeking girls like Jessica Stein and Pernille Teisbaek. This place would fulfill anyone's #Instagramgoals. I don't think I'll ever get over this view from my room at @lesirenuse ❤️???? Given its most fashionable of locations in NYC, the cosmopolitan yet cozy Soho Grand Hotel has become an Instagram staple for girls like former Look de Pernille blogger Pernille Teisbaek. Le Royal Monceau Raffles Paris is oozing with so much quintessential Parisian luxury that it likely takes a great deal of restraint to not Instagram every nook and cranny on the property. Frequent visitor to the city Aimee Song of Song of Style is undoubtedly one of its biggest fans. When it comes to tropical destinations, Kona's Four Seasons Resort Hualalai is perhaps the most breathtaking. The chic, subtly island-themed rooms and palm tree–lined beachfront landscape make it easy to see why bloggers like Jenny Cipoletti adore it for adding a tropical vibe to their feeds. Never coming home ???? Posted something new for you on the blog though! ???? Given that it neighbors Los Angeles, Montage Laguna Beach is a favorite quick escape of L.A.-based bloggers like Peace Love Shea's Shea Marie. It epitomizes California luxury, as you can see. Its sister property in Beverly Hills is another blogger favorite. Every travel bag needs a pair of slides, especially pink ruffled ones. Bloggers like Chiara Ferragni are loyal to their vintage Levi's cut-offs. Behold this perfect travel tote. In case you haven't noticed, Solid & Striped has taken over the beach this year. Meet the perfect throw-it-on-and-go dress. A moto jacket is a must. Mix it up with blogger-approved suede. What was it like to travel before Glossier pink pouches came into our lives? We don't want to remember. This sleek cover would protect bloggers' stamp-filled passports beautifully. Which of these luxury hotels would you most like to visit? Tell us in the comments below!